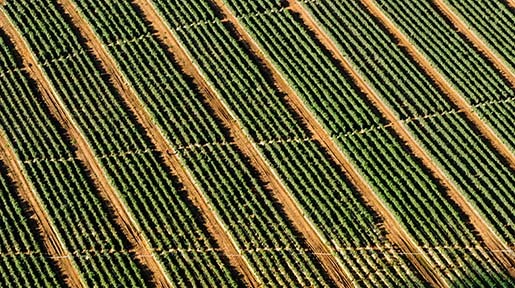 Chardonnay, as we love it best in the U.S., is from the Napa Valley. 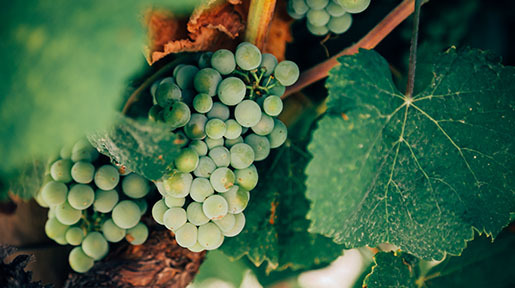 The cooler sub-appellations of Carneros, Mount Veeder and Spring Mountain are perfect for the Chardonnay grape, which thrives in a climate where it can slowly ripen and retain a good amount of acidity. Since the 1970s, Napa valley winemakers have been making a very specific style of Chardonnay: big, rich, full-bodied wines aged in new oak barrels with flavors of stone and tropical fruit, toast, caramel and butter, and high alcohol. Big rich foods call out for this wine, and one can’t think about lobster with drawn butter without longing for a bottle of Darioush Chardonnay. 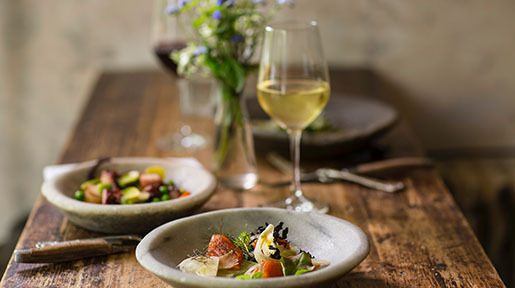 Although there has been a move toward a more subtle Burgundian style—less alcohol, higher acid and not as much oak—big style Napa Valley Chardonnay is still one of the most beloved white wines in our country and plenty of our most favorite foods call out for it. 1.) Mesquite grilled lobster with garlic butter sauce. The mild but sweet lobster meat harmonizes with the ripe fruit flavors in the wine while the grilled flavors mimic those imparted from charred oak barrels. The rich butter sauce stands up to the fullness of the wine. This is one of the most classic pairings for Napa Chardonnay. Newton Unfiltered Chardonnay would be divine with this dish. 2.) Champagne and scallop bisque with crème fraîche. The broth, made with both cream and champagne, is rich yet balanced. Garlic, shallots, onion and thyme used in the broth highlight any earth components in the wine and work well with a bit more acid. A simple but opulent dish perfect for a more restrained style of Napa Chardonnay, like Far Niente Chardonnay. 3.) Maple teriyaki glazed salmon with Israeli couscous and pineapple chutney. It can’t get much better in terms of pairing with a Napa Chard. The sweet salmon glaze and pineapple chutney provide a perfect parallel to the sweet tropical fruit flavors found in some of the more ripe and viscous Napa Chardonnays. The texture of the Israeli couscous works well with texture in the wine (a result of oak aging or lees stirring). A bit of mild cheese like mozzarella melted into the couscous adds to this dynamic. Shafer Red Shoulder Ranch Chardonnay would be a great match. 4.) Grilled chicken with butternut squash coulis and sliced avocado. Chicken is a no-brainer for Chardonnay, and the simple grilled flavor of the meat picks up oak flavors in the wine. The butternut squash is great with the grilled chicken, providing additional flavor to the simple grilled meat but allowing the wine to shine. Avocado adds a rich element that plays to the richness of the wine. 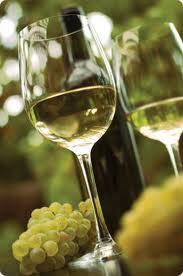 Try Rombauer Chardonnay. 5.) Toasted polenta with Brie and sautéed mushrooms. An easy to make (and meat-free) hors d’ oeuvre and just the thing for your favorite Napa Chardonnay. Button or white mushrooms with fresh thyme will keep their flavor while allowing the flavor of the wine to shine through. Forming the polenta into cakes and baking it in the oven pulls out the flavors of a wine that has been aged on its lees (creating toasty flavors), like Stag’s Leap Wine Cellars’ Karia Chardonnay. The best part about these dishes, especially when paired with Napa Chardonnay, is that they can be enjoyed at any time of the year—grilled chicken and squash when grilling season hits, or scallop bisque when it’s cold and snowy outside—who says you can only drink white wine in the summer? Some of them require a trip to the gym the next day, but a cold glass of rich, buttery Napa Valley Chardonnay with its heavenly pairing partners is well worth it. Enjoy!